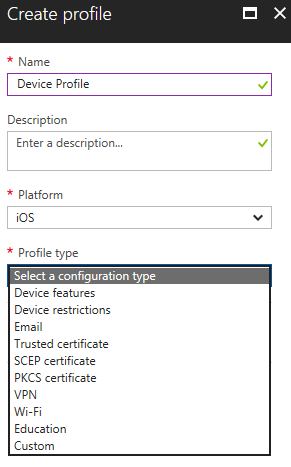 Devices profiles allow you to add and configure settings, and then push these settings to devices in your organization. Apply features and settings on your devices using device profiles goes into more detail, including what you can do. Lists the steps to create a profile. Shows you how to add a scope tag to "filter" the profile. Lists the check-in refresh cycle times when devices receive profiles and any profile updates. In the Azure portal, select All Services > filter on Intune > select Intune. Overview: Lists the status of your profiles, and provides additional details on the profiles you assigned to users and devices. Manage: Create device profiles, upload custom PowerShell scripts to run within the profile, and add data plans to devices using eSIM. Monitor: Check the status of a profile for success or failure, and also view logs on your profiles. Setup: Add a SCEP or PFX certificate authority, or enable Telecom Expense Management in the profile. Name: Enter a descriptive name for the profile. Name your profiles so you can easily identify them later. For example, a good profile name is WP email profile for entire company. Description: Enter a description for the profile. This setting is optional, but recommended. Profile type: Select the type of settings you want to create. The list shown depends on the platform you choose. When finished, select OK > Create to save your changes. The profile is created, and shown in the list. After you add the settings, you can also add a scope tag to the profile. Scope tags assign and filter policies to specific groups, such as HR or All US-NC employees. For more information about scope tags, and what you can do, see Use RBAC and scope tags for distributed IT. Select Add to create a new scope tag. Or, select an existing scope tag from the list. Select OK to save your changes. At any time, users can open the Company Portal app, and sync the device to immediately check for profile updates. Assign the profile and monitor its status.